We continue our artistic and event programming during our main building closure period, most obviously at present via our Flashback archival project exploring our rich 16-year exhibition history. 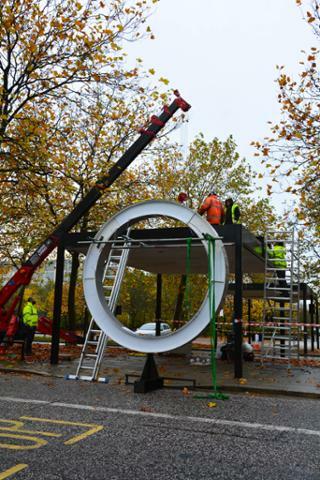 But we’ve also been working with Milton Keynes Council recently to deliver an offsite commission by artist David Batchleor. Installation of Chromocochere, his striking sculptural intervention above a Porte Cochere beside the gallery on Midsummer Boulevard, began today (see pictures below), despite the rain! 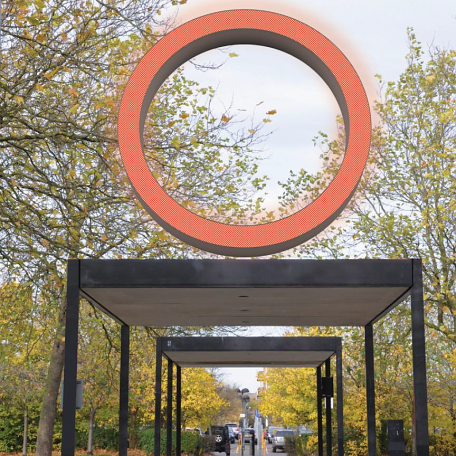 Batchelor is one of four distinguished artists who were commissioned by MK Council and MK Gallery with funding from Arts Council England to make public art in response to the iconic Porte Cocheres and covered walkways in Central Milton Keynes. Read about all four artist’s works HERE. We are delighted that three of the four commissioned artists, David Batchelor, Sam Jacob and Will Nash, are free to join us at 7pm next Wednesday 4 November for a talk timed to coincide with the installation of their new works in the city centre. Rebecca Heald, a curator and Royal College of Art lecturer, will facilitate the In Conversation event, which should provide a unique insight into their respective practices, and the ideas that lie behind their latest, sculptural installations. You are warmly invited to join us for this free event which is open to everyone. Pre-booking is required; you can reserve your ticket now, HERE. 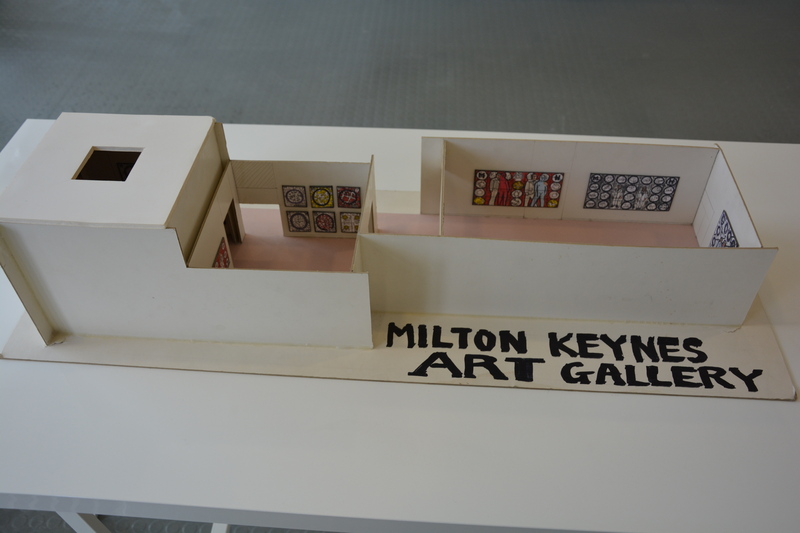 We’d like to tell you about an excellent way to support MK Gallery expansion! 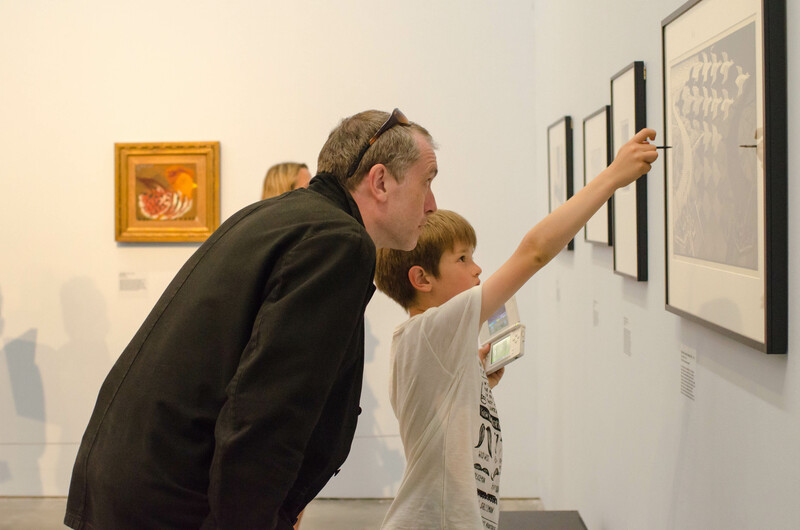 From Tuesday 13 October onwards, all donations up to £10 made to MK Gallery via Localgiving can be matched pound-for-pound at no additional cost to the donor. The doubling of donations is applicable for both one-off and monthly direct debit donations made online via www.localgiving.com/mkgallery. The money raised will contribute towards the final stages of our fundraising for MK Gallery expansion, which will deliver a fantastic new art centre in the heart of the city in 2017. Comprising, beautiful galleries, a dedicated learning space, multi-purpose auditorium and welcoming café/ bar, the expanded Gallery will be a superb facility for residents and visitors alike. 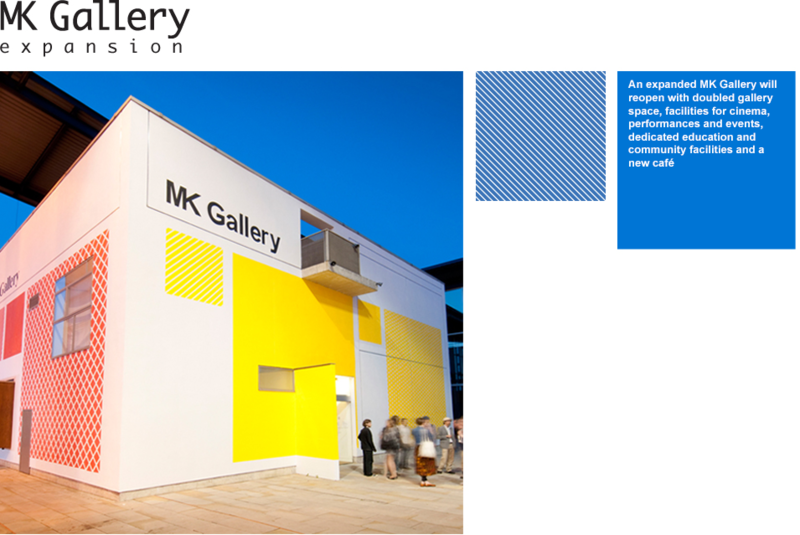 For the last 16 years, through an extensive range of exhibitions, events, participatory workshops and community projects, MK Gallery has provided hundreds of thousands of people in and around the city with creative opportunities, including learning opportunities for families, children and young people, people with profound and multiple disabilities and those living at disadvantage. Thank you in advance for your support and generosity, and please let others know about this campaign! We’re delighted to have opened our first Flashback display last night. 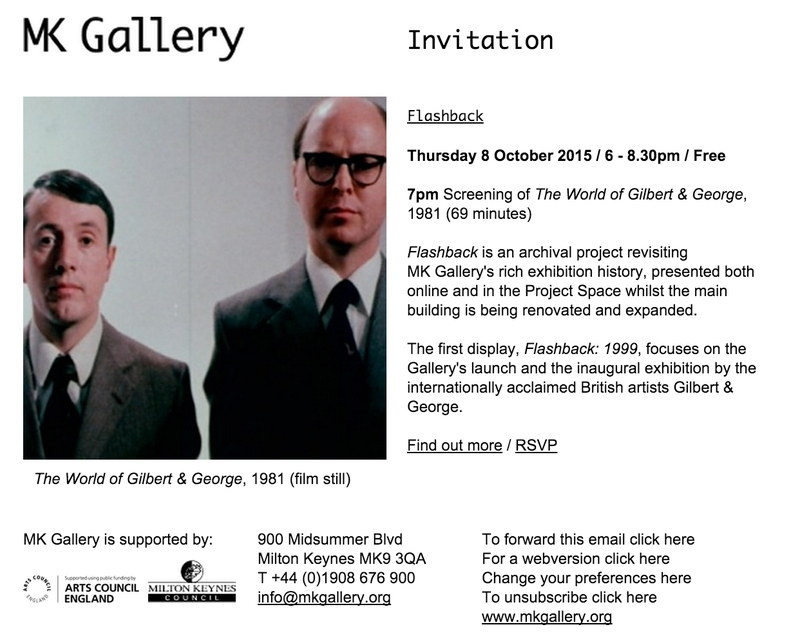 Drawn from our exhibition archive, it focuses on the gallery launch in 1999 and first exhibition by Gilbert & George. We share here some example exhibits, and a couple of photos of staff involved in putting the project together: Claire Corrin, Exhibitions Organiser; Aimee Holmes, Digital Communications Co-ordinator, Katie Fields, Gallery Co-ordinator, and Victoria Mayes, Head of Learning. Flashback: 1999 runs until 29 November 2015. Open Tuesday – Friday 12noon – 8pm, Saturday 11am-8pm, and Sunday 11am-5pm. Admission is free. 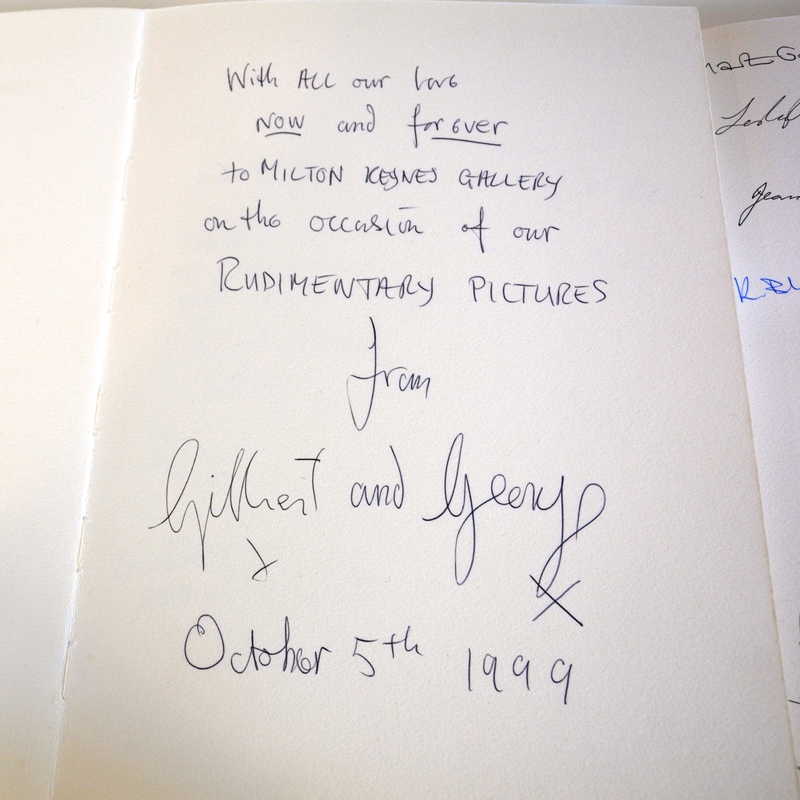 Gilbert & George’s message on first page of MK Gallery’s visitors book for the opening events. Gallery model made by Gilbert & George indicating how they proposed to hang their pictures (1999). 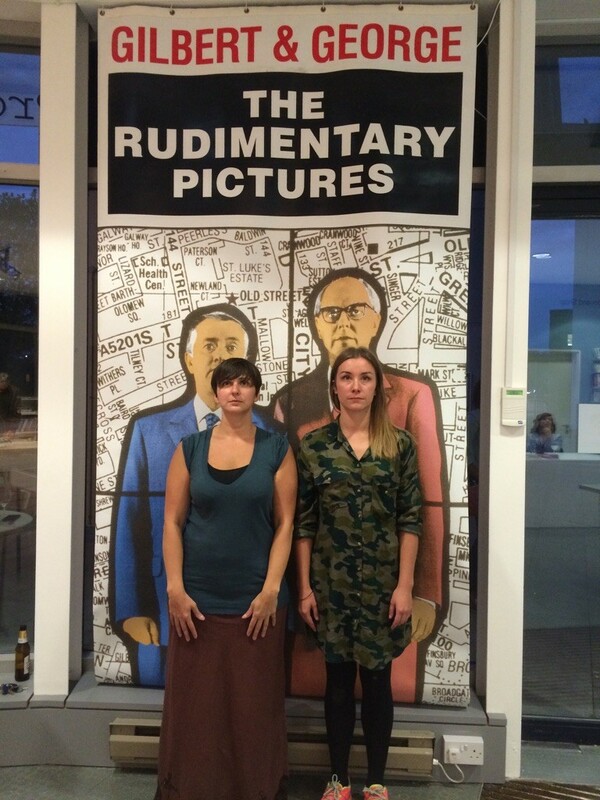 Claire Corrin (L) and Katie Fields (R), with one of the original banners that were hung in thecentre:mk to promote the Gilbert & George exhibition.